One rainy day, Annie asks her grandmother about their family’s history. Grandma Marilyn, who knows just how to tell a story, takes Annie on a genealogical adventure. When she shows Annie her old, dusty photographs, every aunt and uncle seems to come to life. Fascinated by the stories of her relatives, Annie decides to bring them all together in one album of family history. With powerfully touching prose, this delightful story takes readers on a nostalgic journey that will leave them reminiscing about their own families. Fun and quirky drawings bring past relatives out of their frames as Annie’s imagination brings them to life. Although each family member is unique, the love she finds for her ancestors is universal. Her story will inspire children to seek out stories from their past and create a memory album for their own family. 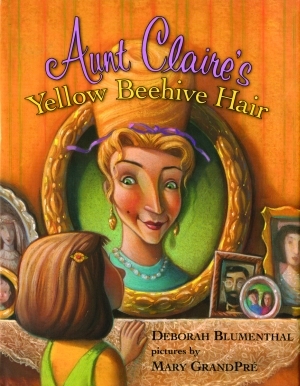 Deborah Blumenthal is the author of two BookSense 76 winners, including Aunt Claire’s Yellow Beehive Hair. She worked as a home design columnist for New York’s Newsday, and her stories have appeared in national magazines such as the Washington Post, Family Circle, and Cosmopolitan. A native New Yorker, Blumenthal lives in New York, New York. Mary GrandPré is the illustrator of J. K. Rowling’s Harry Potter books. She also worked to develop the environmental scenery for the DreamWorks animated film Antz. Educated at the Minneapolis College of Art and Design, GrandPré now lives in St. Paul, Minnesota.